Ant-Man has always been one of the weirdest comic book heroes created by Marvel. Although his super powers are ridiculous in comparison with his peers, which includes hammer-wielding alien gods and superhuman captains, he is still considered a formidable opponent in his own universe. Imagine this: a man can reduce his size to ant-like dimensions while retaining his human strength and even gaining super strength, and he can also communicate with all kinds of insects which serve as his loyal army. In doing so, he can also do various gross things such as riding bugs, straddling red ants and things that would give any kid nightmares, which says a lot about Marvel's marketing strategy. Of course, in today's world, this automatically equates to a big budget - although in this case the budget was a "mere" $130 million compared to its more illustrious comrades such as The Avengers, Iron-Man and Captain America. Funnily enough, this may well turn out to be the best Marvel movie ever released, which goes a long way in proving the fact that it's not how much money you spend to make the film, but how you end up doing it. Ant-Man's plot is simple or complex depending on who you are and what you expect from the movie. Here's how it plays: there's a guy who gets to wear a suit that gives him the power to reduce his size in a jiffy and be awesome. If you are new to the Ant-Man universe, it's a very basic story with no mind-numbing revelations and an easy one to sink into. 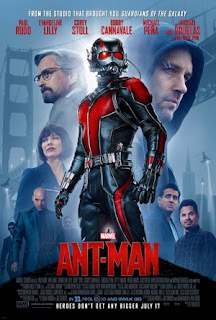 If however you are a huge Ant-Man fan (very unlikely in Mauritius), have read all the comics and talk to insects during your free time, you may feel annoyed that the movie actually focuses on the second generation Ant-Man, but even then, the movie does a great job at also including the original Ant-Man (played by Michael Douglas). The plot may seem weak, but it's actually really solid, faithful to the source material and fun to sink into. In an ever-expanding Marvel colony, it is hard to find a movie that is actually fun to watch and not just about earning as much money as possible while putting cheesy scenes onto another (yes, I'm looking at you Avengers). There was also much talk about Ant-Man not having a top billing character as the lead as the hero is played by Paul Rudd. Sure, he's a not a world renowned actor but he pulls off a great job. I personally think this actually works out in favour of the movie as more emphasis is thus put onto the action rather than ensuring that the actor comes out shining like bright light in every scene (yes, I'm looking at you Tom Cruise). However, this is not only the good thing about Ant-Man. The action is great, the editing is perfect - and this is very high praise for a Marvel movie, I kid you not. This is probably Marvel's finest effort in their gigantic cinematic universe, even beyond the first Iron-Man and basically the only movie I enjoyed watching in a cinema in Mauritius this year (my fault: I missed out on the awesome Mad Max). In other words, if you have not watched it, do so as soon as it's out on Bluray, DVD or whatever. The bad: it's no longer in theatres. They should just get rid of all the crap that's playing right now, and play Ant-Man again.